Just some of the health benefits you will enjoy include, enhanced immune system, digestive support (via friendly bacteria growth), removal of heavy metals & toxins from your body and an alkalising action. Anti-viral properties help to defend against infection. Broad spectrum nutrition helps boost energy, supports weight loss, natural breath freshness and bowel cleansing. Chlorella is a highly nutritious fresh water algae. It contains an impressive range of amino acids, vitamins, minerals, phytonutrients, anti-oxidants, DNA, RNA, & chlorophyll. Children 3-6: 4 tablets daily. Sensitive or delicate types start at a lower amount & gradually increase over a few weeks/months. Best taken in divided doses 2 or 3 times daily. More may be taken in times of extra need. Suitable for vegetarians & vegans. A popular supplement for cats and dogs. Chlorella is an emerald green, single-celled freshwater micro-algae widely recognised as one of the most potent nutritional whole foods on Planet Earth. Each chlorella cell is a self- sufficient organism with all the plant's life functions taking place inside the cell. The result - an unusually high concentration of important nutrients. Chlorella pyrenoidosa is a species of the freshwater green algae genus Chlorella. It occurs world wide. The species name pyrenoidosa refers to the presence of a prominent pyrenoid within the Chlorella chloroplast. The pyrenoidosa specie have been used in traditional Chinese medicine. Also, chlorella pyrenoidosa contains chlorella growth factor or chlorella extract. Chlorella growth factor contains ß 1.3 glucan. 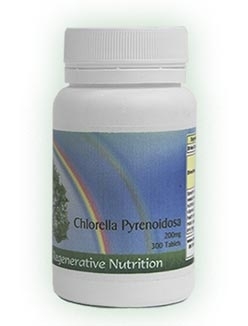 As awareness of the wonderful health benefits of Chlorella has increased, many inferior species have appeared on the market, we only supply the very best species - Chlorella Pyrenoidosa. We always stock a product in the closest form to it's natural form, (freeze dried versions do not compare). Our Chlorella is 'cracked cell wall Chlorella', that goes through a patented low-temperature drying process gentle enough to preserve the nutritional value of the food and still crack the hard cellulose wall which surrounds each cell. This cracking of the wall enables us to digest and utilize the nutrients inside. This tiny plant contains the highest known quantity of chlorophyll within a natural source. Chlorophyll is the 'green blood' of all plant life and has a chemical structure very similar to haemoglobin, our own red blood molecules. Chlorophyll carries oxygen around the blood supply and builds the red blood cell count. It cleanses and purifies the blood stream, kidneys, liver and bowel. Scientists and medical professionals have long recognised the importance of chlorophyll in the diet as a bowel cleansing agent and a natural deodorant, and topically as a wound-healing accelerator. Many "green" foods are good sources of chlorophyll, but results of recent laboratory tests show that Chlorella has more than five times more milligrams of chlorophyll per serving than wheat grass, twelve times more than barley and nearly 10 times more than alfalfa. One of the most important aspects of Chlorella as a health-food supplement is its proven ability to remove any of the toxins that accumulate in our bodies from the food that we eat, the water we drink and the air that we breathe each day. Experiments conducted in numerous countries have shown that the indigestible cellulose of Chlorella's cell wall attracts and binds with heavy-metal poisons such as lead, mercury and cadmium and with hydrocarbon pesticides and insecticides such as DDT, PCB’S and kepone, carrying them out of the body. These environmental poisons are thought to be major contributors to free radical activity, resulting in cancer, brain damage, liver and kidney failure and many other serious, life-threatening conditions. Chlorella's ability to rid the body of these increasingly common toxic pollutants is one more feature that sets it apart from other 'green' supplements and yet one more reason that it is deserving of its title. The Chlorella Growth Factor, or CGF is a unique substance; it is not a single element, but a complex combination of amino acids, nucleic acids. peptides and carbohydrates that have yet to be isolated and identified. CGF stimulates the growth of valuable friendly bacteria, which in turn has a probiotic effect on the body. CGF promotes normal growth but does not stimulate the growth of disease processes such as tumours. Chlorella has immune enhancing qualities as well as the anti-viral effect of chlorophyll. CGF is described as a growth factor because of its unusual ability to stimulate tissue growth and repair. Controlled experiments In Japan with a group of school children have demonstrated this. A small quantity of CGF added to their diet produced remarkable increases in height, weight and strength over a six-month period, when compared to a control group that received no supplementation. CGF does not produce this growth effect in adults, but researchers believe that it speeds up the process of cell replacement and the repair of damaged body tissue. Independent research around the world has demonstrated that CGF and an acidic polysaccharide in chlorella's cell wall can stimulate production of interferon by the body. Strengthening our natural immune systems. Interferon is a substance that controls macrophage activity, and protects the T-and B helper cells that are our front-line defences against viral, bacterial, chemical and foreign protein invasions. CGF derived its name because laboratory tests indicated that the addition of CGF to a standard growth medium increased the growth of friendly bacteria, lactobacillus, by up to 400%. Many researchers believe that CGF, which is unique to Chlorella and present in the greatest values in Chlorella pyrenoidosa grown in sunlight, is the most potent fraction of all. CGF still holds many secrets but is a nucleotide-peptide complex with many constituent parts in very small quantities. ‘The nucleic acid in the human body (RNA/DNA) is responsible for directing cellular renewal, growth and repair. The quantity of nucleic acid in the body decreases from about the age of twenty and insufficient nucleic acid causes premature ageing as well as weakened immunity to common viruses and disease. Nucleic acid is depleted by lack of exercise, stress, pollution and poor diet. Replenishing RNA/DNA is therefore fundamental to every aspect of bodily health, longevity and quality of life’. Since Chlorella has a perfect reproductive single cell it is a more evolved organism than the other more common green micro-algae and therefore offers superior RNA/DNA. RNA/DNA also strengthens immunity by improving the activity of T-cells and B-cells, which are the principal immune system defenders against viruses and other invading microorganisms. CGF is identified as being responsible for the production of macrophages within the immune system, which can assist in the destruction of cancer cells and the removal of cellular debris. CGF is 100% water soluble and so readily "body-available” The 3% CGF content of Chlorella also 'makes it most useful for improving growth patterns in children, maintaining good health in middle and old age, healing injuries and initiating cellular re-growth where it has been stunted by disease or degeneration. Dr. Benjamin Frank was the first to suggest the importance of RNA/DNA nucleic acids in our diet. In his pioneering research into the aging process, he discovered a link between, the body's decreasing production of RNA from the age of about 20 onwards, and a corresponding decrease in the rate at which worn-out cells were replaced by new, healthy cells. As a result of his findings, Dr. Frank suggested that foods high in these nucleic acids would supplement our own decreasing levels of natural RNA and helps to ward off some of the chronic, degenerative illnesses that we associate with getting older. Since Dr. Frank's research was conducted, it has been established that chlorella is 3% RNA and 0.3% DNA by weight. These figures mean that it contains more than 5 times the RNA content of canned sardines, the food recommended as the richest source In Dr. Frank's book 'No Aging diet'. Chlorella contains more than 20 vitamins and minerals, all in highly 'bio-available’ form. Unlike synthetically produced supplements, the vitamins and minerals found in chlorella are all present in a form that the human body was designed to digest and absorb easily and completely. Chlorella is rich in natural Beta-Carotene the most powerful antioxidant, one of nature's highest levels of natural beta-carotene (the chemical parent and safest form of vitamin A, (note: some persons are not adequately able to convert beta carotene to vitamin A proper, this is especially an issue for vegetarians, so supplementing with vitamin A is useful), plus vitamin C and K are found in Chlorella. These are the three vitamins that are now being widely acclaimed as 'antioxidant free-radical fighters'. Free radicals are believed to be created in the body as a by-product of metabolism, and through exposure to outside elements such as sunlight. X-rays, ozone, tobacco smoke, car exhaust and other environmental pollutants. The havoc free radicals cause; damaging DNA, altering bio-chemical compounds, attacking cell membranes and killing cells outright are thought by scientists play a major role in the development of chronic conditions such as cancer, heart and lung disease. Studies indicate antioxidants can help to stop this damage by neutralising and disposing of free radical cells. It has been recently established that neutral beta-carotene has a far greater antioxidant activity than synthetically produced alternatives. Doctors at Harvard Medical School have made a stunning discovery about beta-carotene Monitoring 22,000 male physicians over a 10-year period, they found that those with a history of cardiac disease who took regular beta-carotene supplements suffered half as many heart attacks, strokes and deaths as those taking placebos. Chlorella contains most components of the vitamin B complex. The B vitamin has many forms, each fulfilling an important role in maintaining your health. Chlorella’s B1 (thiamine), B2 (riboflavin), B3 (niacin) B6 (pyridoxine), B12 (cobalamin), biotin (also known as vitamin H), folic acid, inositol and PABA (para-aminobenzoic acid). Vitamin B12 In a plant is a rare, and for vegetarians, it is difficult to obtain B12 from non-meat products in useful quantities (Note: research has found the B12 analogues found in Spirulina actually block vit. B12 absorption, so for vegetarians and those unknowingly deficient in B12, Chlorella is the best choice. Chlorella contains more vitamin B12 than beef liver, one of the richest known meat sources! People are aware of the importance of iron and calcium in the diet, but many others are vital for the correct functioning of our metabolic pathways. Minerals, vitamins and amino acids all work synergistically within these complex chemical production and distribution systems that govern virtually every aspect of our physical and mental well being. If these minerals are missing from our diet. The vitamins and amino acids that we intake are not absorbed and utilised effectively. Chlorella’s minerals include calcium, iron, magnesium, potassium and phosphorous, plus traces of iodine, selenium, zinc and copper. As a source of protein, there are few that can equal Chlorella. It contains 19 naturally occurring amino acids. Including all eight essentials: isoleucinc, leucine, methionine, phenylalanlne, threonine. tryptophan and valine. Making it a complete or superior protein. Amino acids are essential for tissue and cell regeneration, and with their co-factor vitamins and minerals, in the maintenance of our metabolic pathways. The term ‘essential’ refers to the fact that we cannot produce these substances within the body, so we must obtain them through our diet. Essential fatty adds are used by the body to build cellular membranes, and to convert into prostaglandins, which regulate the levels of cholesterol in the blood and control blood pressure. Their presence in fish oil has been isolated as a key reason that heart disease is rarest in those countries in which fish and seafood are a staple dietary Ingredient. Fish, particularly those native to the colder waters at the extremes of latitude are high In Omega-3 and Omega-6 essential fatty acids. As the primary diet of most fish consists of algae and other water-borne plant life, it is not surprising to find these beneficial dietary essentials present in such large quantities within these sources. Chlorella contains a greater quantity of fatty acids than either Spirulina or Lake Klamath wild blue green algae. About 20 of these fatty acids make up the artery cleansing, omega-3, alpha-linolenic variety and it is believed that this is one reason why Chlorella has been shown to be so effective in reducing cholesterol in the body and in reducing atherosclerosis. People who take chlorella when fasting often experience a higher level of energy. Because Chlorella contains 60 percent protein and because it's a whole food, it also satisfies the appetite while providing the energy that results from good nutrition. Many people who use chlorella discover that they lose their desire for unnecessary snacks and don't even miss them. Taken during diets, Chlorella can help restore the natural balance of the body so a real permanent change can be made in your overall health and weight. Chlorella can be incorporated as a positive addition to any weight weight-loss program.